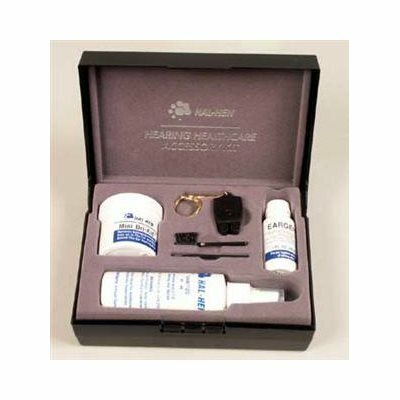 This all purpose kit contains the most popular hearing aid accessories and is ideal for ITE and BTE hearing aid users. Eargene - soothing, refreshing ear lotion that helps protect the skin in ear canals. Mini Dri Aid - helps prevent damage by removing moisture from hearing aids. Hal Hen Sanitize Spray - used to clean in-the ear hearing aids and earmolds. Key Chain Battery Tester - battery tester on a key chain that has a compartment for storing two batteries. Wax Removal Tool - removes wax from hearing aids and earmolds. Cleaning Brush - removes foreign matter in or around the hearing aid. All items are enclosed in a hard plastic case.